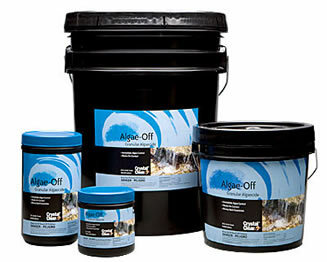 Algae-Off is an all purpose pond cleaner and string algae control product. As an EPA registered algaecide it works on contact to kill and damage algae in normally hard to treat areas such as waterfalls, rocks, stream beds and all locations around the pond. It is one of the safest algaecides on the market today. In the example of cleaning a waterfall area, which is usually a laborous process, Algae-Off makes it easy. Using the power of granulated peroxide, you simply sprinkle or broadcast the product on the area you want to treat while it remains wet. Algae-Off will lightly damage the cell wall of the algae and once damaged it will begin to die. In a few short minutes the granules have dissolved and the water flow can be turned back on. Due to it's low residual tendency it's the only algae killer that we use in conjunction with an on-going beneficial bacteria program (our mainline defense against algae). And don't be fooled, while many products claim to use a similar technology for simple pond cleaning, only several are registered as algaecides, and only one offers superior algae control at an affordable price! **Algae-Off is safe when used as directed. To ensure safety when using this product be sure to apply all granules to the pond water where they will dissolve. Sweep up and remove, or water down any loose granules and do not leave them around where birds, bees, or other wildlife may come in contact with them. Do not apply directly over or near fish, or on desirable plants as it may cause contact damage. Once diluted and dissolved the product will become inert and harmless within just a few minutes. Also it should be noted when applying any "quick kill" treatment to algae to use abundant aeration and only treat sections of the algae bloom at a time to avoid oxygen depletion in the pond, which can be problematic for fish. We generally prefer to use Algae-Off for spot control and targeted treatment for limited algae growth and not pond wide cleaning or green water problems. We currently sell Algae-Off in 10 lb and 25 lb containers. You can view those products below. For small ponds owners looking for the 2.5 lb container please visit the link below for the best pricing and selection. **Note that dosage rates may vary widely depending on the application. Rates above are suggestions on a typical pond however your needs may vary. Go here for safety and MSDS information. This material conforms to the description on the label and is reasonably fit for the purposes referred to in the directions for use. Timing, unfavorable temperatures, water conditions, presence of other materials, method of application, weather, watering practices, nature of soil, disease problem, condition of crop, incompatibility with other chemicals, pre-existing conditions and other conditions influencing the use of this product are beyond the control of the seller. Buyer assumes all risks associated with the use, storage, or handling of this material not in strict accordance with directions given herewith. NO OTHER EXPRESS OR IMPLIED WARRANTY OF FITNESS OR MERCHANTIBILITY IS MADE.